Get out of town with these interesting Brisbane side-trips: Surfers Paradise (SkyPoint Observation Deck, Infinity Attraction, & more), Sea World Theme Park (in Main Beach) and Warner Bros. Movie World (in Oxenford). Pack the 17th (Wed) with family-friendly diversions at Dreamworld. And it doesn't end there: walk around South Bank Parklands, get to know the resident critters at Australia Zoo, identify plant and animal life at Lone Pine Koala Sanctuary, and get great views at Mount Coot-tha Lookout. 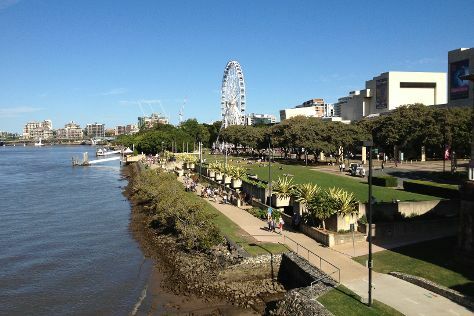 For ratings, maps, where to stay, and more tourist information, go to the Brisbane online trip itinerary maker . If you are flying in from United States, the closest major airports are Brisbane International Airport and Gold Coast Airport. April in Brisbane sees daily highs of 78°F and lows of 61°F at night. Wrap up your sightseeing on the 23rd (Tue) early enough to travel back home.